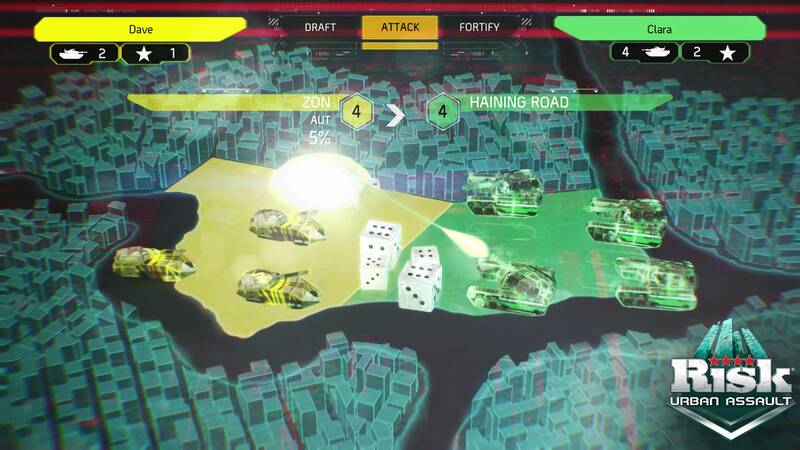 From Shangai to New York, lead your troops to victory in a post-apocalyptic world. Lead your troops to victory with RISK® Urban Assault! In the near future, rapidly rising sea levels cause extreme food shortages, triggering mass riots and anarchy throughout the world. RISK® Urban Assault, there are no more continents. As governments collapse in once-prosperous cities, new factions step into the power vacuum, fighting intense battles for total control. RISK® Urban Assault is an exciting new game set in famous cities from around the globe. At its heart, it retains the DNA that makes RISK® so popular with an additional layer of strategy introduced by commanders, facilities, and alliances. • Wage war across five famous cities: New York, London, Paris, Hamburg, and Shanghai. 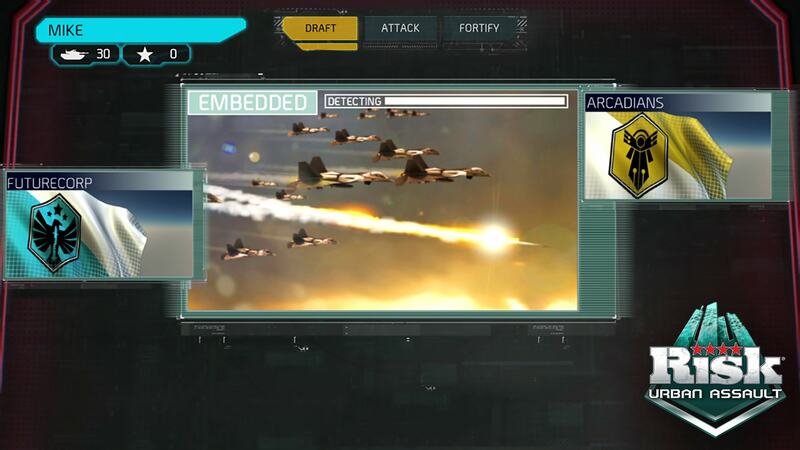 • Each faction has a default commander and additional commanders can be unlocked. • Employ commanders with their unique abilities, from troop reinforcements to massive bombardments. They will thus bolster the strength of your troops and directly influence battles. • Build facilities such as military bases, broadcast towers, and missile bases to help your cause. • Become mayor of the city, and take control of city finances or outlaw your opponents by placing bounties on their heads. • Make temporary deals with other players by offering incentives for cease-fires. 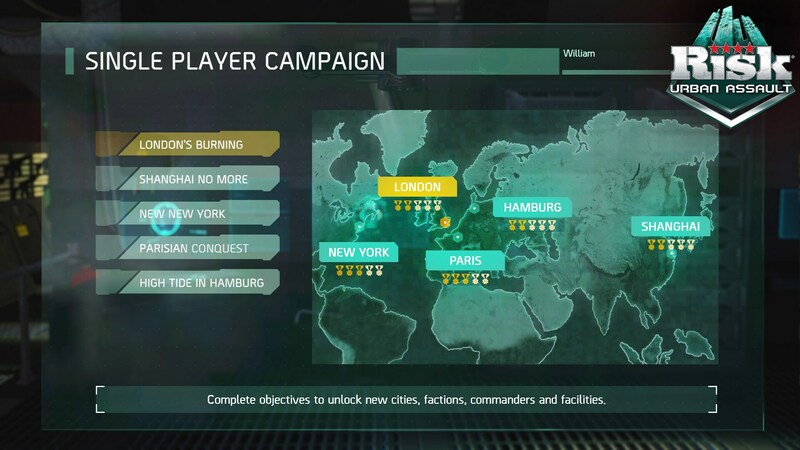 • In campaign mode, earn medals by completing objectives to unlock new levels. 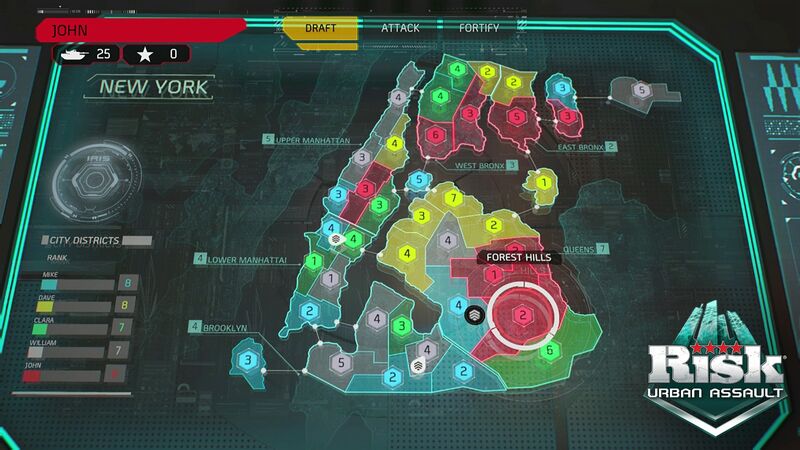 • In custom mode, choose the number of players, and AI, your map, your objectives, and enjoy a unique game. - Play six games in a league and earn points as you win games, knock out other players, and simply stay alive at the end of the game. - There are four leagues, and you can gain promotion to the top or get relegated to the bottom. You earn medals for being promoted and for winning leagues. RISK is a trademark of Hasbro and is used with permission. © 2016 Hasbro. All Rights Reserved. Licensed by Hasbro to Ubisoft Entertainment. Game software © 2016 Ubisoft Entertainment. All Rights Reserved. Ubisoft and the Ubisoft logo are trademarks of Ubisoft Entertainment in the US and/or other countries. The “PS” Family logo and “PS3” are registered trademarks and “PS4” is a trademark of Sony Interactive Entertainment Inc.